We have splendid collection Poly Dupion of Cushion Cover. We are one of the leading Cushion Cover Manufacturer. 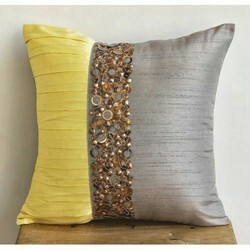 We are leading supllier of Jacquard Cushion Cover. The Embroidered Dupion Cushion Covers enhance the elegance of the living rooms of the customers. 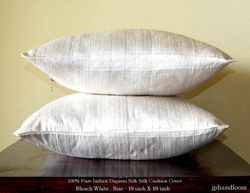 Our sophisticated range of silk cushion covers is available in variety of designs and colors. Each cushion cover is finely embroidered with varied patterns to meet the clients expectations. We are offering an exotic range of poly dupion embroidery which is manufactured by our designers and experts as per the international trend of the market. These embroideries are offer at optimum prices and are vibrant in color and designs.